Hector "Toe" Blake of Coniston and Joffre Desilets from Capreol Ontario were joined at the hip and formed a formidable tandem with the Montreal Canadiens in 1937. The pair combined for 23 goals to help rebuild the sagging Habs team after the untimely death of Howie Morenz. 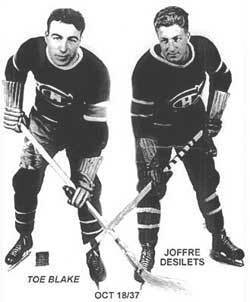 The Habitants had won three Stanley Cups in the 30's and Hector with Joffre were factors in the Canadiens success.